By 1901, Charles Garnier had established his reputation in Paris as a masterful designer of jewelry. Working in the time of Cartier and Vuitton, his creations soon became respected and admired for their exceptional quality and elegance. More than a century later, Charles Garnier Paris continues this tradition. 1-year limited warranty against defects! 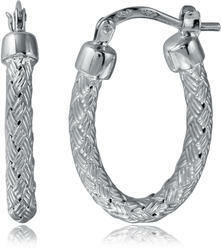 Silver huggie hoop earrings by Charles Garnier.